Have you ever been on a long leisurely boat trip past the South Bank of the capital? It is a lovely way to while away an hour or so. On a clear day (and providing it is not too cold) it is a great way to get a different perspective that the capital has to offer. Obviously you only get to see a small part of the architecture but it is fascinating nonetheless. A river trip like this will let you get a good look at things you may otherwise miss. City Hall is an intriguing building that, at first glimpse, looks a little wonky, but it is actually perfectly fine and a great home for Boris and his friends. Seeing Southwark like this must have been very different centuries ago, How the skyline has changed in that time, with no skyscrapers and none of the incredibly modern buildings that line this stretch of the river. Everything must have been very different then, and we are not just talking about architecture. Food would have been a very different proposition, and unless you were one of the wealthier people in town, it was probably rather unpleasant. Some things however have stood the test of time, and some have trendy once more. Welcome to the twenty first century Taste the Cracklin hog roast event catering! You heard me loud and clear. It may have been a Medieval feast and very probably enjoyed in many of the establishments that still line the river but Taste the Cracklin events are becoming increasingly popular and show no sign of losing their appeal. It may seem a little odd to see such a feast enjoy such renewed popularity but with the amount of interest and coverage given to traditional cooking and historical dining, it must surely be no surprise to see hog roast appearing at social functions and events both here and throughout the United Kingdom. A hog roast may have been a rarely spotted creature a decade ago but now they are a more frequent sight at events in venues, hotels, pubs and even residences across the borough. You get to see what is involved and see what it provides, it actually makes perfect sense that this has become a modern catering solution that is loved by many thousands of people. After all, your special event is all about enjoying great tasting food and that is something that our food provides plenty of, and some. 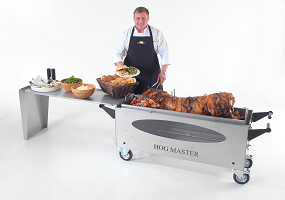 In fact that is one of the very best reasons to choose a hog roast chef to cook for you, for your big ‘do’. Sometimes it can be a real struggle to decide who to invite to an event and who leave out. It is a little bit cruel because there will always be someone who you cannot invite. Well, this is one dilemma that you can be spared. Hog roast is a big feast, as you know, but did you realise just how big? Well, a single Southwark pig is an accommodating pig and will allow you to cater for over one hundred people! That will surely feed every one of your guests. Can’t be bad at all, can it? But there are more reasons to recommend it. This is real food that uses real ingredients. This is a special food, Sounds a bit over the top but it’s true. You cannot really say that a dozen oven cooked pizzas and some cold chicken drumsticks come into the same category as a huge, freshly cooked hog roast, can you? Remember that this is a pig that will have been bred with great care at a local farm and then carefully cooked for six hours in order to give your guests some incredible tasting meat. Six hours hard work, now that really IS special occasion food! But let’s for one minute forget the hours that it takes to cook or the incredible amount of meat that you get from each pig and simply consider one fine point. What does it actually taste like? Well, a Taste the Cracklin hog roast has not become popular simply by being a freshly cooked meal. It is the wonderful flavours you get that has made hog roast a real superstar. If you want your guests to leave you event and think ‘what a great meal that was’ then it has to be high – if not top – of your planning list. A Taste the Cracklin hog roast really is the catering sensation you have been looking for.